Gov. 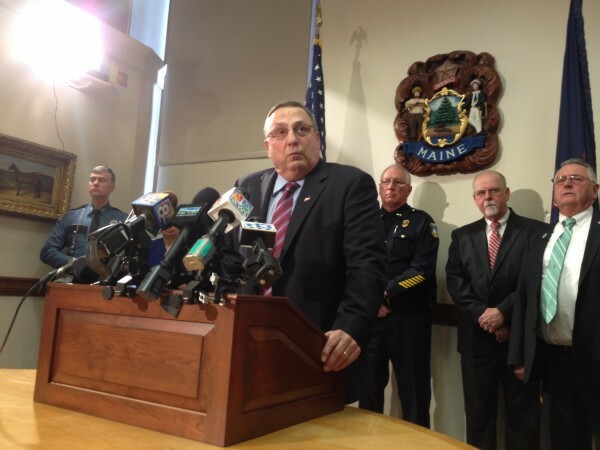 Paul LePage discusses his plans for fighting drug abuse in Maine. AUGUSTA, Maine — Maine’s Republican Gov. Paul LePage offered details on a plan he’s offering to the Legislature that would increase efforts to arrest and prosecute those using and dealing in illegal drugs. 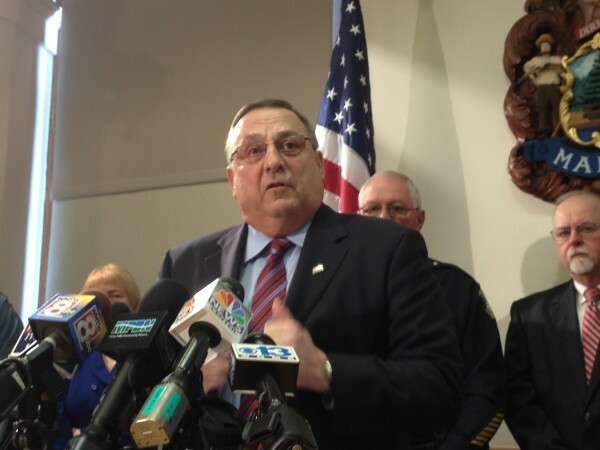 LePage set combating drug crimes as a high priority during his State of the State address in February. To that end, LePage said his legislation would add 22 new state positions including 14 new Maine Drug Enforcement agents, four new prosecutors for the Office of the Maine Attorney General as well as four new district court judges to bolster the state’s four drug courts in Lewiston, Presque Isle, Bangor and Portland. LePage said he did not know how much it would be to fund those positions but a fiscal note on the legislation suggest it will be $347,000 in fiscal year 2015. Flanked by law enforcement officers from around Maine, LePage again detailed the large number of Maine babies that are born drug-affected and also criticized the state’s methadone treatment clinics meant to help those addicted to painkiller medication and other opioid drugs like heroin. When asked if he supported a proposal that would limit Medicaid-funded methadone treatment to just six months as opposed to the current 2-year limit, LePage said he did. 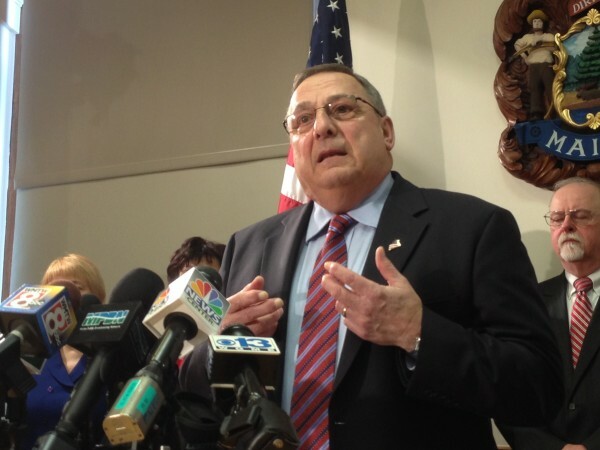 “The methadone clinics in the state of Maine are an absolute dismal failure,” LePage said. He said the methadone needed to be provided in a clinical setting only, and Maine’s clinics were not doing that. Just Tuesday morning, LePage met with a group of physicians regarding Maine’s problem with prescription drug addiction, he said. He said he intended to focus equally on the addiction side of the drug equation but did not offer any details, saying only he would be working with Maine’s Department of Health and Human Services Commissioner Mary Mayhew to establish what more needs to be done and what the state’s approach should be. Adrienne Bennett, a spokeswoman for the governor, told the Bangor Daily News earlier this month that the new legislation is only part of the administration’s approach. In his State of the State address, LePage lamented the toll addiction takes on children, highlighting the 927 drug-affected babies born last year in Maine. Bennett pointed to DHHS’ ongoing efforts to address the problem, including the formation in 2012 of a task force that now includes more than 70 health care professionals, substance abuse prevention, treatment and recovery providers, DHHS staff and others. Maine also employs a state coordinator to oversee programs for drug-affected babies and fetal alcohol spectrum disorders, who works with many stakeholders, including other states, Bennett said. “Pregnancy is one of those times where women who have substance use disorders are often taking inventory and may be more open to treatment than they would at a different time in their life,” state coordinator Andrea Pasco told the Bangor Daily News earlier this month. Pregnant women who abuse drugs are given priority placement for treatment services, and exempted from the state’s two-year cap on methadone treatment. Once the babies are born, state programs help to ensure a healthy home environment, including the Maine Families Home Visiting Program, aimed at helping parents to bond with their babies and understand child brain development, she said. He also said those convicted of low-level drug crimes were not creating crowding issues in Maine jails. Cumberland County District Attorney Stephanie Anderson backed LePage up, saying her county’s jail had bed space and had closed down a pod recently because they didn’t have enough inmates. Anderson and Roy McKinney, the director of the MDEA, said the bulk of crime in Maine was being driven by illegal drugs. But some Democratic lawmakers said the governor’s plan doesn’t pay enough attention to treatment and recovery programs for addicts. “There are Mainers who today, are living drug-free lives — and the reason for that is the treatment required by the oversight of the drug court,” state Sen. Anne Haskell, D-Portland, said. “I am pleased to see more resources allocated to the drug courts. However, they are only half the answer. “We simply are not going to arrest our way out of drug addiction,” Haskell said. State Rep. Mark Dion, D-Portland, the House chairman of the Legislature’s Criminal Justice and Public Safety Committee, likewise said he didn’t take issue with bolstering court and law enforcement resources. But he disagreed with LePage’s overall philosophy of battling drug crimes. The American Civil Liberties Union of Maine criticized LePage’s approach Tuesday, challenging him to prioritize and focus on diversion and treatment programs over more arrests. “In Maine, drug arrests have gone up nearly 240 percent since the mid-1980s. Yet despite the increase in enforcement, abuse has skyrocketed,” a release from the ACLU of Maine stated. They also noted the state saw more deaths, 163, from drug abuse than it did car accidents in 2012, based on information from the state’s attorney general. The public will get a chance to weigh in on the governor’s proposal when it goes to a public hearing before the Legislature’s Criminal Justice and Public Safety Committee later this month. BDN health editor Jackie Farwell contributed to this report.